CTI Material’s patented Flexiphene aqueous nanomaterial emulsions are just what you need to disperse nanomaterials into aqueous solutions. Flexiphene works with SWNTs, MWNTs, GNPs, and many other nanomaterials. 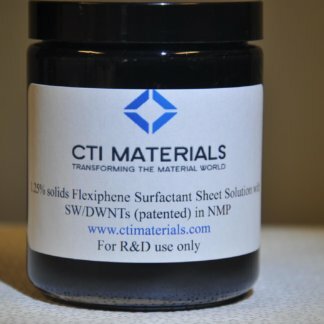 Flexiphene are amphiphilic, tunable surfactant sheets, highly soluble in many solvents and can make colloidal dispersions of nanomaterials, stable for weeks to months. We typically work with Di Water and can modify the solution if required. Please contact us today and let us know what materials you require, the loading ratios, and solvents and we can quote it for you. Prices depend on materials used and loading ratios. Flexiphene aqueous nanomaterial emulsions are transforming the material world!